After rounding out 2010 with a rousing global music dance show on Spin The Globe, let's open 2011 with something beautiful, nurturing, sublime. Combining cello and kora isn't a recipe for a sweaty dance party. But in the hands of masters like Ballaké Sissoko and Vincent Ségal, it's a pairing that's far more nourishing than yet another glass of UV Blue Party Lemonade. We’re the same age. We have the same kind of family, a son and daughter. We have the same way of life, playing these quiet instruments passionately. I’ve spent time with many musicians, but it’s not the same as it is with Ballaké. What they have created is a music that straddles the boundaries between classical and folk, Africa and Europe. Appropriately titled Chamber Music, the CD does have an intimacy about it, a sense that you're sharing an emotional moment in a small room. It would be hard to perform this quiet music well at a festival, or even a large concert venue. Its patient pacing and soft melodies demand the listeners attention and focus. I should point out that other musicians also appear on the disc, including Mahamadou Kamissoko (ngoni) and Fassery Diabate (balafon) on Houdesti, and Demba Camara (bolon) on several tracks. 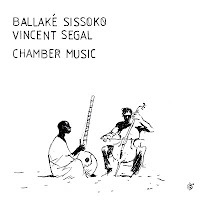 The 10 original songs (seven composed by Sissoko, three by Ségal) are primarily instrumentals, and go through different moods, particularly as Ségal changes from bowing to plucking. "Wo Ye N'gnougobine" is the duo's closest brush to Afropop, and the CD closes with "Mako Mady," a subtly stunning display of how closely the two work together. It's a partnership that transcends language, both artists say. "We just learned to play together without saying anything," Ségal says. Agrees Sissoko: "It was important to get to know each other musically. ... We built our work together, step by step. Today, when we play, we understand each other without saying a word: One look is enough." One listen may be enough to hook you. Since this is the first post of the new year, it seems appropriate to offer for your listening pleasure the track "Future." May this help inspire your new year!